Here’s part 2 of the video. My video converter wouldn’t let me have it all in one go (and thus I am on the market for a new converter program now). I’ve gone back to edit part 1 to have a link to this video as well. Here is part 1 of a 5-minute video of a short level I put together in a playable demo. I play through the puzzles and traps of the level and show off some of the details and mechanics of the game. Please forgive the large amount of placeholder art and the rough nature of the game so far. Here is a short video showing off some combat mechanics and example animations. The zombies will stalk the player and attack with a melee animation. I’ve included sound in this video as well, although there’s no music in this clip. I’ve done up some more rooms and made another demo video! This one shows how navigation will work in the game. Right now the camera is still orthographic due to some control scheme issues, but I assure you, isometric/diagonal walls looks pretty sweet as well. I’ve finally taken a short video of some of the mechanics in my game! I’ve posted it on the YouTubes for both of you to see it. The video looks pretty blurry right now so I might have to re-post it or mess around with it later. It’s my first time posting a video, so it might take some effort. I got some time this weekend (and inspiration) and decided to work on replacing the borrowed tilesets so I can get closer to finishing a short demo for my game. 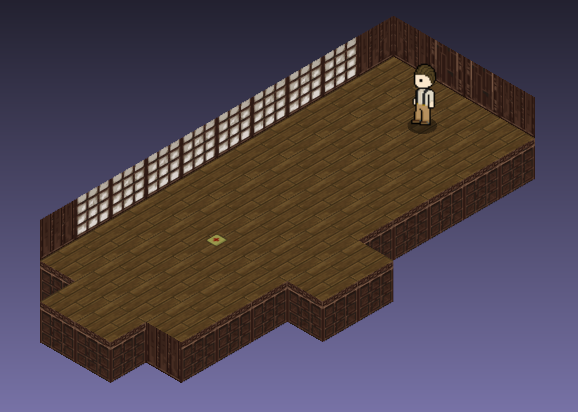 I have a bunch of new floor tiles and walls now, and even went as far as to add new code for some missing features. 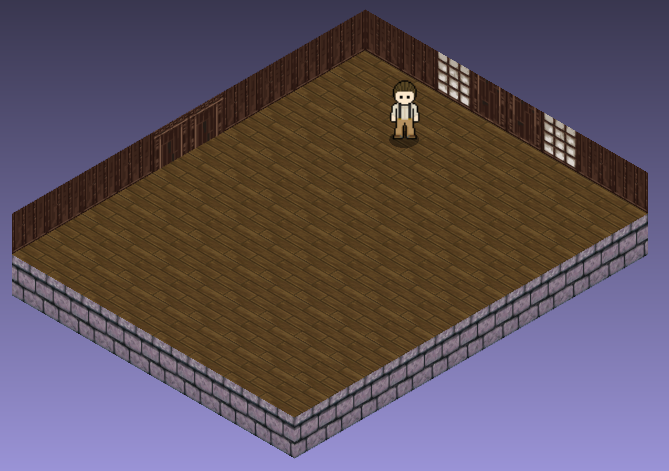 I wanted to have interactive wall components (for example, for the player to be able to examine paintings, etc. 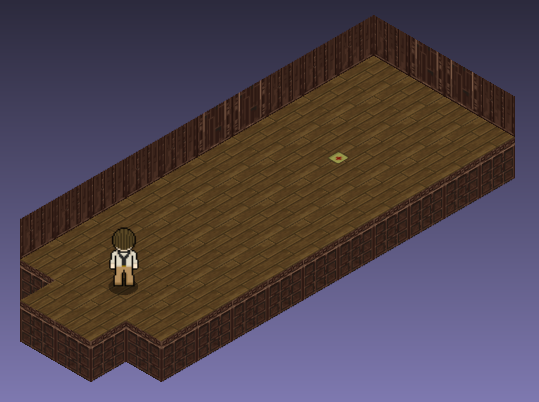 ), and have them work the same as the furniture does (furniture gets an outline when you are in range to search it). So it looks nice now. The wall paintings function the same as frontwalls, so you can only see them when the camera is in position, but you can see the coloured highlight regardless of direction. Here’s a few screenshots (one of them is an old one to show off the 3D pillars I added a while ago. I’ve given the engine description page a facelift. There is now some pretty images and a more up-to-date and polished list of the features. So I’ve started building an action-adventure-horror game using the new upgrades to the Paper Donkey Engine. If you’ve been following along, I’ve added a physics engine and many other nice features that would support an action game that’s rendered in a 2D-in-3D style using billboards. This weekend I made good use of the built-in scripting engine to make a weapons HUD, shooting, item pick-ups, and a bunch of other things. 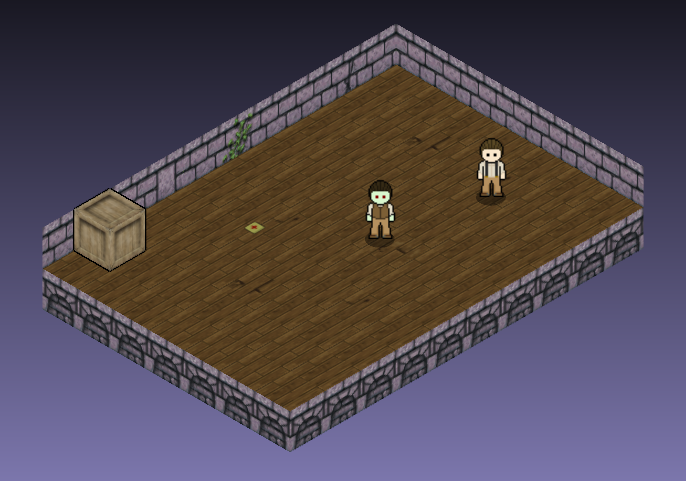 I’ve added a zombie enemy type that slowly chases the player to try to attack them. The player has a 6-shot revolver to battle the zombies right now and there’s a wide selection of sound effects in the game. Walls and objects can have custom materials assigned so bullet impacts make different noises. On a minor note, I’ve started making more character art so I can build up a demo that’s a bit more interesting to see. Right now I have 4 directions for the player character and I’m working on walking animations and additional weapons. I have some neat ideas for the game demo that I’m excited to put in as well (storyline and dialogue, etc). So I haven’t posted in a very long time now, mostly due to me being busy with research and life. I have a few projects I want to post some stuff about though. One of them is the SpeedGame I created last September for a competition. It’s codenamed Paper Donkey and is essentially a 2D-in-3D engine I wrote in Processing. I had a teammate (Matt) for this project and so I made him do most of the game design and level creation aspect of it so that I could focus on engine coding. We didn’t really care about winning anything, but mostly just wanted the experience of working on a team to make a completed project. The game we came up with itself was a little on the dull side. Due to time constraints, we had to trim the game mechanics to just a maze. That being said, I would consider it a huge success. I only really wanted to build an engine I could use to prototype games and I got what I wanted. The engine code is pretty nifty and it works great. 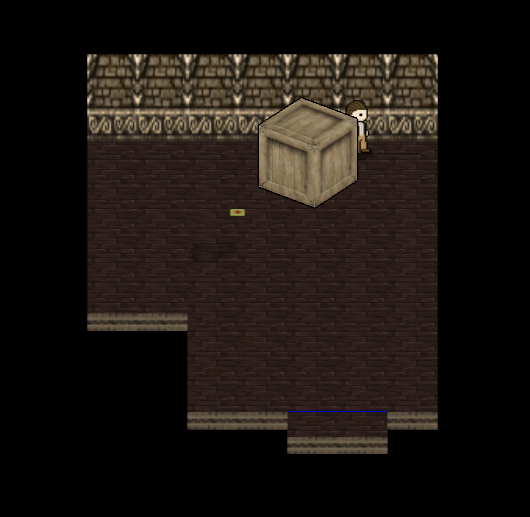 There is a slight performance issue though since I do some pretty naive collision detection and other things like that. Also, a couple of the features ended up being really glitchy so I removed them from the levels. The engine renders 2D sprites in a 3D perspective. So the level geometry is represented by floor and wall tiles while the characters are rendered as billboards that always face the camera. It has a pretty decent animation system, but no editor so the files have to be created by hand to specify animation sequences. The same goes for the levels because I didn’t bother to use my old map editor formats for this project. It has been a while since I’ve worked with the engine, so I’ll have to take a look at it in order to post more on the exact features of it, but it was a blast to make and use. It took about a week to build and a week to make the game on top of it.